Memorabilia belonging to war hero Adrian Warburton being presented to Malta Aviation Museum director Ray Polidano (left) by Jack Vowles, 83, a personal friend of Warburton and the engineer who took care of his aircraft. A film reel found in a reconnaissance aircraft nearly 60 years after the plane crashed in a field in Germany during the war, killing its famous pilot, Wing Commander Adrian Warburton, is now another important war relic at the Malta Aviation Museum. The reel was presented yesterday to museum director Ray Polidano by Jack Vowles, 83, a personal friend of Warburton and the engineer who looked after his aircraft. The plane crashed on April 12, 1944. The 6mm film, along with the rest of the wreckage, had been buried under soil until it was discovered two years ago. Wing Commander Warburton, known as (Warby) won fame in Malta for his photo reconnaissance work in Sicily and North Africa. He was the second most highly decorated pilot of World War II and was sent to Malta after serving with 22nd Squadron of Coastal Command. On the day of the crash, Warburton was on an American aircraft, a Lockheed Lightning F-58, taking pictures of the ball bearing plant at Schweinfurt, but did not show up at the pre-scheduled rendezvous. There followed much speculation about what might have happened to him, and one of the versions was that he flew back to Malta to live with his girlfriend Christina. But on August 12, 2002, Anton Huber, a German historian, began to excavate a site in a field south east of Egling, Germany where an Allied aircraft was reported to have crashed. At the time, a group of boys had said they had seen an aircraft flying low and trailing smoke before flipping onto its back and diving into the soil. Dr Huber located the site with the help of the US Army and found an engine from the port wing and a plate indicating that it was a Lightning. 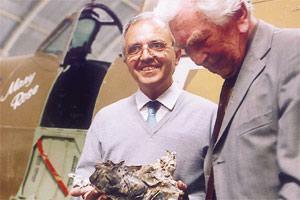 Other wreckage, including a propeller, a length of film in cassette and blue-grey coloured clothing were also recovered along with human remains. When examined, they were established to be Warburton's. The film was handed to the British Ministry of Defence which agreed with Mr Vowles' suggestion that it should be donated to the aviation museum in Malta. There was one condition: that it should be personally delivered and presented by Mr Vowles himself. Warburton was buried at the Commonwealth War Cemetery in Durnbach, Germany in May 2003. In his memory, the Malta Aviation Museum exhibits parts of the recovered aircraft wreckage, a piece of Warburton's flying boot and the Union Jack which draped the coffin during his funeral. The flag was given to Warburton's widow who in turn presented it to Mr Vowles for the Aviation Museum.